With more rain and the temperature definitely dropping a few notches during the week, winter is certainly on its way. 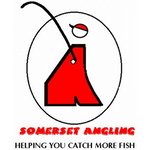 With Rob still away and Hurf unable to fish, it was down to me and Steve P to organise this one and I have to say a big thanks to Frank and Jake who went down and checked out Hambridge yesterday (still too weedy) and also did some work at Isle Brewers, cutting out swims so people can get their boxes in. We had quite a bit of rain on Saturday night although there wasn’t much forecast for Sunday. On my way to Ilminster in the morning, I had a quick look at the river at Donyatt and it looked quite nice, I then stopped at Horlicks where it was chocolate and pushing through and I thought the pond would be the best bet but on arriving at the bowling club, the general consensus was that the river would be okay and should drop during the day. I put in five pegs at Redbridge with the rest at Isle Brewers and really fancied pegs 125, 126, 128 or 129. Adie went in the bucket early and unbelievably managed to pull out peg 128 for the third match running, a great peg although I think he’d quite fancy a change of scenery! Steve P drew 125 and his drawing hand is on fire at the moment, Langport invader Baz Morgan pulled out 128a and wasn’t impressed at all. By the time I got to stick my hand in the bucket, there was only one ball left, I said to Frank that I hoped it wasn’t peg 111 and he said he already had that. I took the last ball and was chuffed to see I was on 126 (Barney’s Bend), a great peg and one that normally does well with extra water on. Driving to the river, there was loads of standing water about and I was starting the fear the worst, as I pulled up, Baz said the river looked horrible and when I took my kit to the peg, it was chomping through but I did have some slacker water on the far side. Of greater concern was the howling wind and I felt sorry for the guys at Redbridge as they would be pretty exposed up there. I’d made up some new rigs yesterday and put one on but it was a bit of a nightmare trying to plumb up with the flow and the wind and I was still faffing about when I noticed the start time had come and gone. I started with two red maggots on the hook and trying to run the float through in the flow but there was just too much pace on it so I stuck another section on and went further over into the steadier water. A couple of small fish had topped and I thought I’d get indications straight away, even if it was from minnows. The problem was the wind and I just couldn’t present the rig any sense and it wasn’t helping with my feeding either. After half an hour I hadn’t had a bite and was surprised when Steve P appeared behind me, he said his peg was racing through and he hadn’t had bite either. I was just starting to think it might be a case of going through the motions until the last hour or so, by which time, hopefully, the level would have dropped a bit, when my float sailed away and the strike resulted in some blue hydro showing itself, I shipped back gently and swung in a 2oz dace, Steve had seen enough and left me to it. Next chuck, I had another dace and started to think I was going to bag up but then, typically, I couldn’t get a bite. I tried double bronze maggot and started getting some small roach and then had a slightly better one of 4oz or so. The wind was absolutely horrendous and I dread to think how bad it was for the lads at Redbridge, I just netted another roach of 3oz or so when Frank arrived behind me, he’d walked down from peg 111 and said his swim was basically unfishable at the moment, he reported that everybody in his section was struggling and above the bridge, Steve P was fishless and Bill just had two minnows. He walked down to see how Adie, Baz and Terry ‘The Toast’ were getting on. 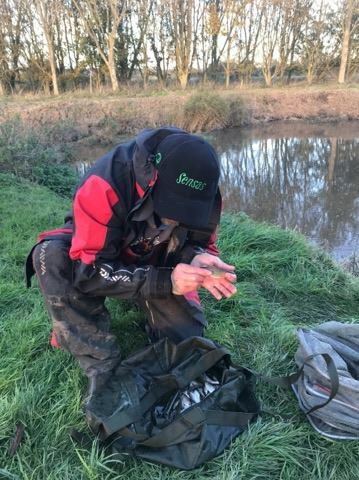 On his return he said I was winning the match easily as Baz and Terry hadn’t caught and Adie had a fish so small he couldn’t tell if it was a dace or a minnow! 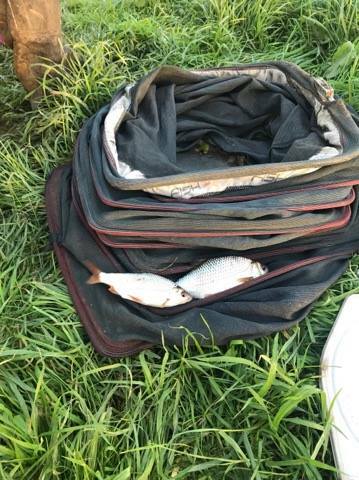 I didn’t want to start counting my chickens yet as I certainly wasn’t bagging and as things stood it would only take a chub or a few good roach to blow me out of the water. I kept trying caster and had the odd fish on it but they weren’t any bigger than the fish I was catching on maggot and I was having to wait ages for bites. 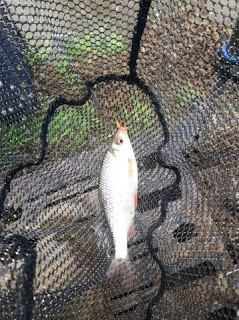 I was catching mainly dace and roach along with a couple of gudgeon, I’d only had one minnow which is normally a good sign and I was still hopeful that some bigger roach might put in an appearance. I’d been keeping an eye on the water level and it was dropping quite quickly. With a couple of hours to go Terry popped to his car to get something and came over and said he still hadn’t caught. I kept putting the odd small fish in the net and with about half an hour to go I probably only had 2lb or so. I heard somebody come through the gate and when I looked around Scott Jackson and Mike Board were walking across the field, I looked back at my float just in time to see it slide under and this time the strike resulted in more solid resistance, I carefully shipped back and slid the net under a lovely roach of 8-10oz, the best fish of the day. 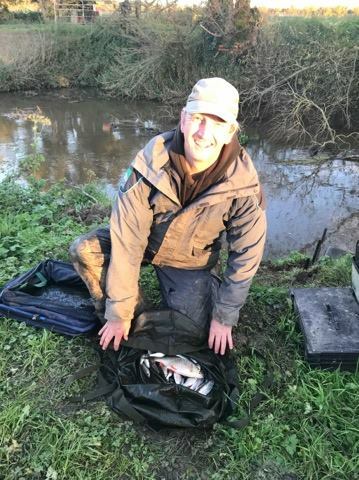 While they were with me I caught quite well and I don’t know whether it was the time or day, the fact the river had dropped or a combination of both but I added another 5 or 6 fish to finish with 47 and I hoped I might have 3lb or so. I packed up and as I had the scales I walked down to weigh Terry in first but met him coming the other way, he’d packed up and chucked a 4oz roach back. I hoped that wasn’t going to cost him as I’ve done something similar in the past and missed out on a default section win so now as long as I’ve caught, I always weigh in. Baz had managed to winkle out a couple of decent roach for 9oz and then Adie had done well catching loads of small fish shallow for 2lb 4oz. 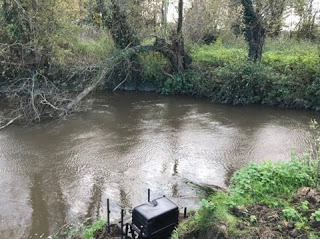 We got to my peg and my fish went 3lb 10oz and when the others came down from above the bridge, Jake had 3oz from 123, Bill had 2oz from 124 and Steve P hadn’t caught, it had been that hard! Back at the results and they’d struggled at Redbridge as well where Fieldy had done the best with a few dace for a 1lb from 120. So I’d won my first match for a while and picked up £56 plus a nugget from Steve P to make the side bet score 2-2. We should have fished the pond today and that’s twice in recent weeks we’ve got it wrong but as I’ve said many times, it’s a thankless task running matches which is why I’m glad I don’t do it very often and fair play to those that do. 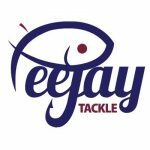 obviously that doesn’t necessarily tell the whole story as conditions can play a massive part and others factors like peg 123 has only been used a few times whereas 120 has been in every match but I do enjoy looking at facts and figures and I’ll keep this list updated as we fish the rest of the league fixtures and I’ll try and put some interesting stats on here regularly. At the moment, the dominance of Isle Brewers is pretty evident (with the exception of 110) although I do think Hambridge will have a say when we start using it, I also think Coxes would have been a better bet than Redbridge today and would probably have provided the winner.